Pediatric Specialty Services (PSS) combines the most qualified specialists from a broad spectrum of medical fields in order to focus on providing an unparalleled quality of care and treatment for children. Our patients become our family, and specializing in each field permits a higher commitment to excellence, allowing us to continue to serve those that we value so highly. PSS is a multidisciplinary group of pediatric specialists committed to providing comprehensive care for kids. 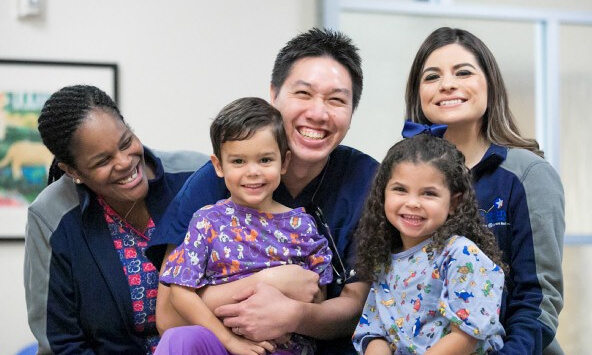 Our physicians came together from across the spectrum of pediatric care to form disease based care teams that drive both healthcare and academic medicine in Austin. Whether it is for a small injury or a lifelong congenital condition, our goal is to deliver the best care to your child as seamlessly as possible. The care team at PSS is here to guide you at every step of your journey. With the latest techniques and technology, we can provide a level of care you will not find anywhere else. While a doctor’s office may seem like a scary place, our team and facilities will have your child forgetting about the visit and getting excited about the future.